Andrew’s father was learning to be a squirrel. “What is your dad doing?” the other kids would ask. “He’s practicing—” was Andrew’s reply. Andrew was almost eight years old. He lived in a yellow two-story house. The staircase had a banister he could slide down, when his mom wasn’t watching. The upstairs bathtub had been leaking for almost a year, so Andrew showered downstairs. They had a cat, Adelaide, who brought the family gifts of small rodents from the acres around the house. The backyard was big and sloping, enclosed by a fence that came up to Andrew’s chest. Flakes of blue paint were chipping off the fence, and you could see Andrew’s footholds that he used to vault over it. “Andrew, use the gate!” his mother would cry from the kitchen bay window where she sat to do crossword puzzles. Andrew’s hands would grasp the top of the fence, and in two steps he’d be over and running down the slightly sloping land, into the trees that grew on the acres behind his house and yard. This is where he first saw his father talking with the squirrels. Andrew timed his breathing with his footsteps, in, out, left, right, in, out, left, right. Leaves crunched under his feet like the screams of tiny elves. He grabbed hold of a branch to slow himself, and swung his body around, feeling the sharp bite of the bark in his palm, smelling the moss and the fungus that lived in the trees. His breathing slowed and he ran his hand down the tree before walking on. He heard a voice to his left, and he walked toward it as quietly as possible—a difficult feat over dry late-September oak leaves. It was his father, on the ground on hands and knees. There were leaves in his brown-gray hair and a little twig on his shirt sleeve. He was peering up intently at an oak tree, and didn’t see Andrew approach. “What?” His father cocked his head toward the tree. There was a squirrel, bushy tail spread out behind him, clinging to the bark on the tree. “Ah, I see.” Andrew’s father rose to a crouching position, and Andrew could see he held something in his left hand. His father raised it to his mouth, and holding it in both hands, began to nibble at it–it’s a walnut, Andrew realized—as he would at a piece of pound cake, or a chunk of smoked Gouda cheese. Andrew watched, fascinated, as his father finished the nut and wiped his lips with his thumb. He then moved, still in a crouch, toward the tree. The squirrel, who had watched Andrew’s father the whole time, suddenly looked at Andrew. His father turned too, just as suddenly, and almost fell over when he saw his son standing there. “Andrew! What are you doing? Don’t you have chores to do?” He had stood and was brushing off the jeans he wore on weekends, and shaking leaves out of his hair. “Finished ‘em. What are you doing, Dad?” Andrew asked. He pointed to his father’s sleeve, and his father brushed the tiny twig away. “I already ate,” Andrew said. The squirrel had run up the tree into the high branches, and he scanned for it, but it had blended in and disappeared. “Yeah.” It was the perfect time of day to play in the woods. The sun was beginning to fall, and it was slitting through the trees in places, creating glitter out of the dust in the air. There were places Andrew could see the actual shafts of light, and he liked to stand still and watch them shift and then disintegrate as the sun moved out of place. He liked the way tree trunks went fire orange right before the sun finally set. The woods could never be the same because leaves fell and trees grew and squirrels ran madly like small senile old ladies and the sun never stopped crawling across the sky. “I’ll see you later then. Remember, the squirrels are very interesting. They can teach you anything.” His father winked solemnly. “Just listen to them. Bye, Andrew!” He began to make his way back up the hill. “Bye, Dad!” Andrew called, then turned and surveyed the trees around him. This thing was going around on Facebook, and One Classy Dame tagged me to do it, but I felt like it deserved slightly more space and thought than just a Facebook status or note. Then I forgot about it for a month. But I remembered. And so I thought I would share with you 10 books that have been important in my life. 2. Anne of Green Gables by LM Montgomery / Little Women by Louisa May Alcott. Two wonderful books, particularly for young girls, written by excellent female writers. 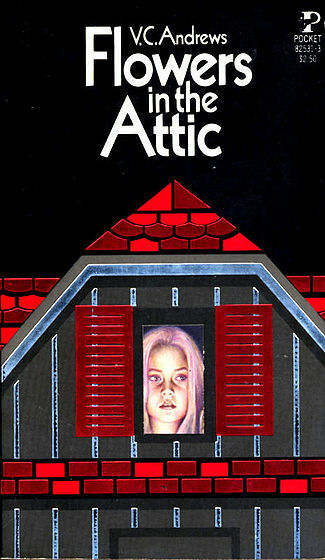 I was deep in my VC Andrews phase when my parents got me a copy of each of these books for Christmas, and I remember being vaguely disappointed. (I’m really sorry, Mom and Dad!) But then I read the books, and I liked them. I reread both of these books in 2013 and they’re even better than I remembered. 3. Fried Green Tomatoes at the Whistle Stop Cafe by Fannie Flagg. The first time I’ve ever liked a book and a movie adaptation, as separate things. It happens rarely…but it happens. 4. The Grapes of Wrath by John Steinbeck. Okay, this is kind of a long story but bear with me. When I was younger, we made a lot of movies. Not exactly home movies, because it wasn’t stuff like birthday parties and Christmas morning. We would make movies for class projects or just for fun. And I remember making some kind of movie, where I – as a middle schooler – was reading The Grapes of Wrath to my little brother, who was at that point maybe…10 years old? I have no idea what this was for. And we kept cutting away to show the clock ticking forward, and I’d be further in the book, and my brother would be more and more bored. And finally by the time I read the last lines, I think he was gone maybe? Or just asleep? I don’t remember. Anyway, at the time of making that movie, I tried to read The Grapes of Wrath, and I was SO BORED. Then, in my junior year of high school, we read it in my English class…and I loved it. I couldn’t understand why, just a few short years before, I hadn’t gotten into it. So, to me, this book is a solid representation of growing up and maturing. 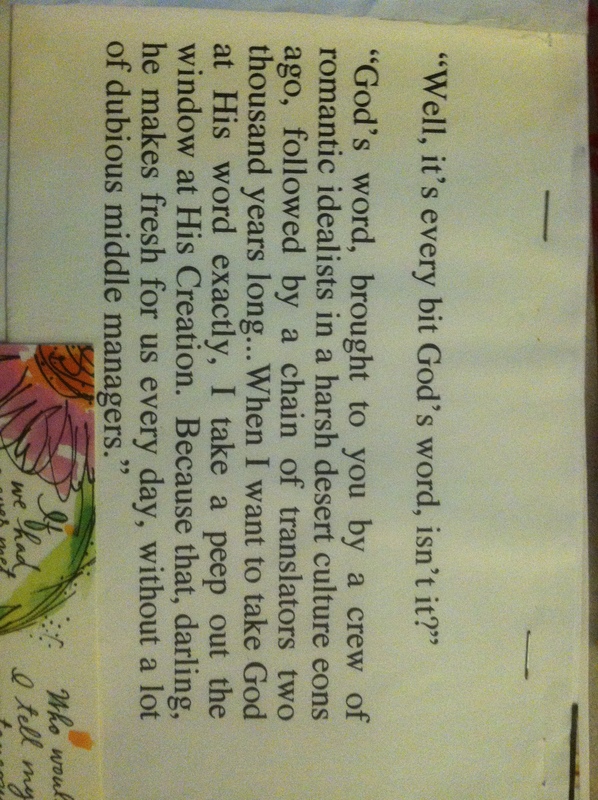 Thank goodness I had the presence of mind to not print in an artsy font. 6. Me Talk Pretty One Day by David Sedaris. My first exposure to nonfiction humor. Before that, I assumed “nonfiction” meant “history book” or “book on how to refinish a dresser.” David Sedaris, a gem in and of himself, opened up an entirely new world of reading to me. 7. The Time Traveler’s Wife by Audrey Niffenegger. The first time I ever cried while reading. You know what I’m talking about. 9. Healthy Sleep Habits, Happy Child by Marc Weissbluth MD. I read a bunch of parenting books when I was pregnant, to prepare myself, and then I read a bunch of books on dealing with an infant, when I had an infant. This was the first book that I got partway into…and just had to toss out the window. There was so much BS in it, and I figured I had two choices: I could either throw it all away, or I could go crazy trying to follow all these rules to have the perfect child. This book represents my revelation that you read some books, you talk to some people, you do what works for you. And everything will be all right. 10. The Harry Potter series by JK Rowling. I know…it’s cheating. But these books (all seven of them) feel like family to me. Like, I know there are some minor plot holes. I know that some people have complaints about them. I know they’re totally overexposed. And I DON’T CARE. To me, they are perfect. 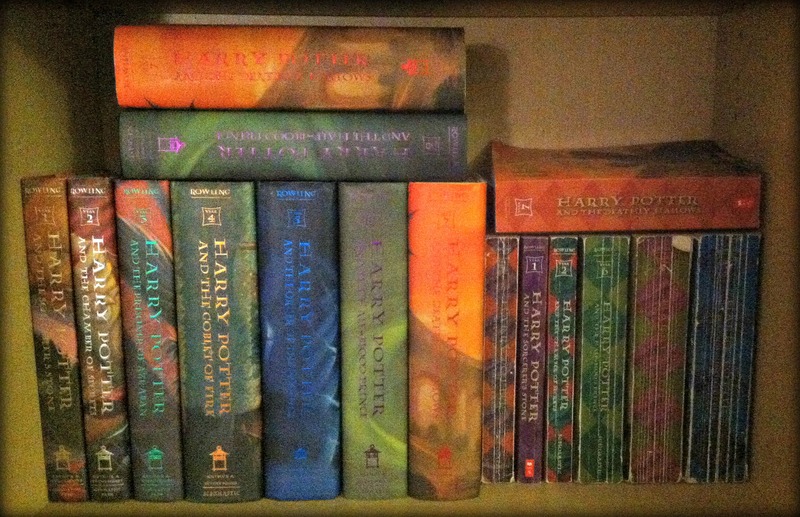 I have all these memories: of reading The Sorcerer’s Stone for the first time and realizing this was something great; of sitting, waiting for the mail when the fifth book was coming out, and reading it all in a day; of Drew declaring his intention to read them all out loud to me once I was pregnant. (For the record, we are on the seventh book – it’s slower going now, but we’re still making progress.) These books are ingrained in my adolescent and adult life…and I’m proud of that. A set of hardcover for posterity; a set of paperback for actual reading; and some spares. Okay. So, I realize that technically there are still 4 more days in November; and that if you can conceive it and believe it, you can achieve it; and it’s not over until the fat lady sings, etc etc. But here’s the thing. I have some really good reasons for why I’ve decided to quit Nanowrimo this year. 1. Ultimately this is about fun. So when I’m having an adult temper tantrum because I “have” to write, then the purpose has been defeated. At least for me. 2. I guard my sleep jealously these days (since it’s still interrupted multiple times a night, and it’s always over by 7am at the latest). I’m not about to stay up until 2am writing, like I used to. 3. I thought I liked my story, until I got to a point that I was like, what the heck is this about. (Yes, I know that’s kind of the point of this whole thing.) But then I abandoned it midstream and switched to this YA novel idea. And it was downhill from there. 4. I also joined a dietbet this month, and I won that, so you know, you win some, you lose some. 5. When I started this, I was shooting for 25,000 words (the “real” goal is 50,000). I figured that 25,000 would still be impressive, especially with the other things I’ve had going on this month. And I made it to about 32,000 words. So I think that’s something to be proud of. So…that’s that. Sorry, I hate when people just whine about how busy they are. But I’m not going to spend the next four days (and over Thanksgiving, even!) feeling guilty and stressed about this. There’s too much other stuff to pay attention to. Sorry, unfinished weird novel. I’ll read you over in a few months and see what’s salvageable. RIP.